A remix of キルト by Patchworker's System, titled キルト (Patchworker RMX), can be found in pop'n music うさぎと猫と少年の夢. キルト could be unlocked in jubeat knit APPEND as part of the APPEND FESTIVAL event, by playing Macuilxochitl in pop'n music 19 TUNE STREET. By then playing キルト in jubeat knit APPEND, the song was unlocked in pop'n music 19 TUNE STREET. In jubeat copious and its APPEND version, it is one of the UFO unlocks of the copious travel unlocking system. In jubeat saucer, it can be unlocked via the bistro saucer unlocking event. In jubeat saucer fulfill, it can be unlocked as part of saucer macchiato's Side Menu from April 23rd, 2014. In jubeat prop, it can be unlocked by playing it as a BONUS TUNE from May 28th, 2015. As of jubeat Qubell, it is available by default by playing with an e-amusement pass. キルト is the only Osamu Migitera song to predominately feature Sana on vocals (she also sang the chorus of pop'n music 9's ホネホネロック). キルト is Sanae Shintani's only original song for the jubeat series. knit, the pop'n music character for キルト, also appears on the jacket. A 3P palette for knit is available for inputting the code found at the back of the pop'n music card PD19R015/016. The code must be inputted at the final e-AMUSEMENT screen, where your already unlocked Secret Characters are shown. In pop'n music 20 fantasia's 6/18/2012 update, knit's 3P color shows in her background the cover art of FLOWER (http://twitpic.com/9xukdq). However, FLOWER was first made playable on the pop'n music Sunny Park location tests. When the first location test of pop'n music Sunny Park ended, FLOWER was available to play in pop'n music 20 fantasia as part of the pop'n music Sunny Park & REFLEC BEAT colette Location Test Memorial Event. キルト is one of the GITADORA preview songs made available for GuitarFreaksXG3 & DrumManiaXG3. Along with the other 8 GITADORA location test songs, キルト is included on the GuitarFreaksXG3 & DrumManiaXG3 Original Soundtracks 2nd season album. キルト received an EASY chart on December 12th, 2012 in pop'n music Sunny Park, replacing its old 5-Buttons chart. キルト was removed from jubeat saucer on February 1st, 2013. However, it was later revived on April 15th, 2013. It was removed again on December 1st, 2013. It was revived again on February 1st, 2014. キルト received new Drum and Guitar BASIC charts twice in GITADORA: when GITADORA was released and in GITADORA Ver.1.03. キルト is one of the unlockable songs of the first phase of REFLEC BEAT colette -Autumn-'s Pastel Adventure colette Harvest unlocking system. From REFLEC BEAT groovin'!! to REFLEC BEAT VOLZZA 2, キルト was playable by default. According to shio, a Des-ROW/Sana song collaboration had been wished for as far back as pop'n music 10's "Pray to the stars" event (including from her herself), an event that resulted in various crossovers/collaborations with BEMANI artists/options/new charts/playable characters that were not in the series at the time. She says in her comments, "whoever requested for it 6 years ago, I hope they're listening". In jukebeat and REFLEC BEAT +, キルト's title is romanized as Quilt. キルト was added as an unlockable song in ポップンリズミン's TREASURE MODE on February 14th, 2014. 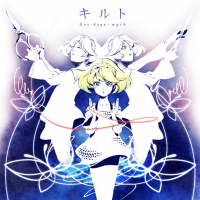 After being removed from the initial release of REFLEC BEAT 悠久のリフレシア, キルト was revived on March 23rd, 2017. キルト's EASY chart was re-rated in pop'n music うさぎと猫と少年の夢 on March 29th, 2017. A girl who came from jubeat. A red thread that meshes with a lonesome look... Who is she waiting for? GF/DM XG and GITADORA difficulty rated from 0.00 to 9.99.
jubeat to clan difficulty rated from 1 to 10, and 1 to 10.9 from festo onwards. ※ The notecount of this chart is different from the old 5-Buttons chart (total notes: 169). This page was last edited on 2 February 2019, at 17:01.